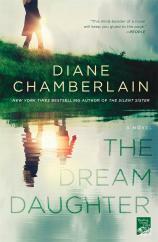 THE DREAM DAUGHTER by Diane Chamberlain has been one of my toughest Bets On write-ups, as I want to give away nothing about it. One of the delights of the book is the slow reveals that will unfold and be great "aha" moments. It opens in 1970. Carly Sears is a young pregnant widow who is living with her sister and brother-in-law on the Outer Banks of North Carolina in Nags Head. Her husband was in Vietnam. At a routine doctor's appointment, Carly learns that she is carrying a daughter with a heart problem. Her brother-in-law, a brilliant physicist, is familiar with technology that can help her baby receive the in vitro surgery that she needs to survive. He actually has lived life in the future. What happens and what intervenes along the way will give readers a lot to think about.